One of our municipal clients has converted a series of ten springs (that have been in service since 1900) to infiltration galleries and has installed a U.S. Filter Memcor membrane filter unit to filter water from the infiltration galleries. This system was pilot tested in 2003 and permitted in 2004. The second filter has been purchased and pilot tested for the nearby Possum Creek. Application to the Pennsylvania Department of Environmental Protection will be made for the required permits. 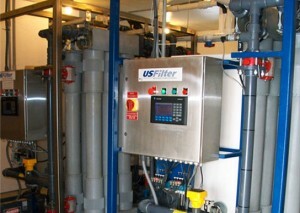 The filtered water supplements two low yielding water supply wells in the system. Most of the project construction costs have been covered by grant funding, either CDBG, Growing Greener and Community Facilities.